The New York Cosmos have been called the world’s first superclub, the original Galacticos. Their place in soccer history is forever linked to the heydays of Pele, Beckenbauer and Chinaglia. We have all heard the stories about Mick Jagger and Henry Kissinger in the locker room, and a rock star aura that no American club has since replicated. The Cosmos attendance records at Giants Stadium are only now being challenged by Atlanta United, 35+ years later. But those days ended back in 1984. The Cosmos returned to the field in 2013, the reboot christened by the presence of Pele, and proceeded to put together an unparalleled run of excellence in the American Second Division, under the leadership of manager Giovanni Savarese. These new Cosmos have had stars too – Raul in 2015, Marcos Senna from 2013-15 and Juan Arango in 2016 – but other than Raul none were at the level of fame of the original Cosmos icons. Although the team played in the less than ideal Shuart Stadium at Hofstra University, the place was a fortress in terms of results, and the Cosmos made great memories for their fans during those years including three Soccer Bowl titles and three US Open Cup scalps of New York MLS clubs. 2017 saw the Cosmos move from Long Island to Brooklyn, with a more professional atmosphere highlighted by the iconic backdrop of Coney Island’s amusement parks. While MCU Park never became the fortress that Shuart was in terms of on-field results, it created an environment more conducive to growing the club in terms of attracting fans. The Cosmos’ 2018 season is currently in question due to the de-sanctioning of the NASL by the USSF. New York Cosmos fans remain eager to support their club, but the possibility exists that there will be no team for them to follow in 2018. While the league and club offices work diligently to try to resolve that, there is another alternative, and one that could be great for soccer in America. The Cosmos could acquire a majority stake in Sky Blue FC, rebrand them as the New York Cosmos, and play them out of MCU Park. Going forward, the Cosmos would field both a men’s and women’s team, once the men’s team was out of legal purgatory. Sky Blue FC is one of the founding members of the NWSL, but they play out of Yurack Field on Rutgers University’s campus, with average attendances in Piscataway, NJ hovering in the 2500 range. The NWSL is a league filled with world class talent in the women’s game, as evidenced by the USWNT Women’s World Cup title in 2015. If the Cosmos acquired Sky Blue FC, the Cosmos name would provide the NWSL a profile its New York area franchise that it has never had. Cosmos owner Rocco Commisso would also give his club’s fans a team to cheer for in 2018 (and beyond), keep the customer base activated and attract new fans. Being at the top level of its sport, the women’s team could bring greater attention to the overall organization in the New York market. Likewise, using the famous Cosmos name could give a rebranded NWSL club a fresh look from the New York media. Sky Blue’s current majority owner Phil Murphy is the recently elected Governor of New Jersey, estimated to be worth several hundred million dollars. As part of the deal, Murphy and his ownership group could receive minority stakes in the Cosmos, or perhaps even buyout the positions held by Seamus O’Brien and Sela Sport. The combined ownership group would have financial resources and political connections to rival any sports team in the US. FC Kansas City was acquired by Real Salt Lake this offseason and will play going forward as the Utah Royals, 1000 miles away from where they started, abandoning the KC market. A Cosmos acquisition of Sky Blue FC would only move the team by a 45 minute drive, and would put the club within walking distance from a subway stop, inside the city limits. Alternatively, a women’s Cosmos team could apply as an expansion club, and give Sky Blue an immediate local rival, and reduce some of the travel costs. Once the men’s team is ready to go again, scheduling for both teams could be done synergistically. 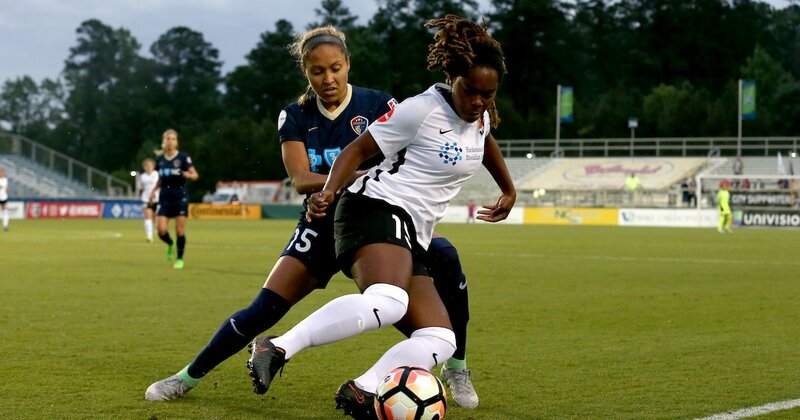 In North Carolina, the Courage of the NWSL outdrew the men’s side. Cosmos COO Erik Stover told “The Pint After Podcast” that the Cosmos had been looking into modular stadium options prior to the league issues, and an NWSL team would give the Cosmos men a co-tenant in their own venue, consolidating a soccer community that is all inclusive while highlighting some of the most talented players in the country. It would be hard to replicate the Cosmos glamour of the late 1970s and early 1980s in any North American men’s pro soccer league, but the NWSL features the biggest stars in the world of women’s pro soccer. It’s easy to assume that an Alex Morgan Cosmos shirt would fly off the shelves faster than any US-based male player. Helping strengthen the NWSL would also provide something of an olive branch between the Cosmos and US Soccer. The biggest challenges in a deal may be ideological and political. NWSL is a single entity league, with many owners of MLS franchises amongst their ranks as well as Commisso nemesis, North Carolina owner Steve Malik. Convincing those owners to let a firebrand like Commisso into their exclusive club could be the most challenging aspect of the deal. Additionally, convincing Commisso himself to buy into a single entity, while publicly endorsing (and legally pursuing) a men’s pyramid of promotion and relegation, could be equally difficult. Still, business is business, after all MLS sold franchises to Chivas and Red Bull when it was in a similar place to where NWSL is today. The less said about MagicJack, the better. Suffice it to say pragmatism could rule the day. The Cosmos have an iconic brand that would add some gravitas, enthusiasm and most importantly, money into the struggling women’s league. If Miami FC were to follow suit and put an NWSL team in South Florida, it would also go a long way towards showing the good intentions of those two billionaire owners as they ask the USSF to reshape the structure of the men’s game. From their perspective, Commisso and Silva could also look at it pragmatically and judge that the NWSL is in the early stages where the single entity is helpful to get the system off the ground, and see boosting NWSL as a double good deed of mending fences and propelling the women’s game forward. A New York Cosmos women’s team – either through expansion in a future year or by acquiring/merging with and rebranding Sky Blue FC in the nearer term – would be a great step that would boost the combined club and the NWSL. We ask only one thing in return for the idea: Gender equality calls for the women’s soccer team to have a “Cosmos Boyz” dance squad. (Sources confide that Midfield Press’s Steve Hamlin would audition, but Hamlin did not confirm by time of publication, as his outfit is still at the cleaners).